If you paddle whitewater, sooner or later, you are likely to end up in a situation with a pinned canoe (yours or someone else’s). Shaped like a giant scoop, and prone to floating low in the water, the tandem canoe is the boat that most often ends up wrapped around a rock in the current. Safe boating practices can reduce the risk of a wrapped canoe, and with a good understanding of safe and effective techniques, most boats can be unwrapped. As with any rescue, the best option is prevention. Scout larger rapids to identify and avoid likely pin rocks. Especially concerning are hard to reach rocks in the middle of the river – no technique will save a wrapped boat if it cannot be reached safely. As your canoe speeds towards a can opener rock, the temptation is to lean upstream, away from the rock presenting the “scoop” side to the current. Instead, shift all of your body weight downstream, onto the rock. The current will hit the bottom of the canoe, pushing your boat up and over the rock, or giving you time to swing the boat around, or get out onto the rock. For day trips, a full set of airbags will make a canoe less likely to capsize due to swamping. On an expedition, when there is no room for a centre bag, end bags can be used. They won’t stop the canoe from swamping, but a capsized canoe with any airbags will float higher, which makes it easier to rescue, and more likely to get pushed over rocks instead of pinning on them. Some people choose to rig their gear into the boat either by securing with rope or webbing, or by using a canoe spray deck. This can displace water (especially when using barrels), and may provide rigidity in the case of a pin. Gear attached to a canoe should be rigged securely, and the group should be familiar with appropriate loaded canoe rescue techniques. Account for and stabilize swimmers before approaching the wrapped boat. Once people are accounted for, any boat retrieval starts with making contact with the boat, using the most effective technique within the rescue team’s level of acceptable risk. The canoe can act as a strainer, and is often best approached from the eddy it forms. The last thing you want is to unwrap the pinned canoe, just to have it wrap on another rock, or go over a waterfall. 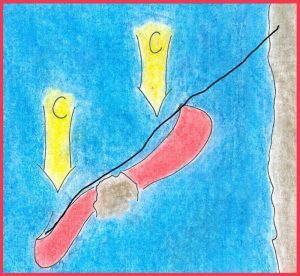 Often, a control rope managed by rescuers on shore can help the boat to pendulum in. But watch for other rocks in that path; sometimes it is best for the unpinned boat to float free and be T-rescued. This rope or ‘tag line’ can be clipped to the grab loop of the canoe (check the condition of the grab loop, and make sure it is a continuous loop, and not just stopper knots). 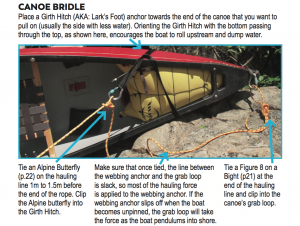 If the grab loop is not strong enough, or when hauling from shore, use a canoe bridle instead (see below). The shore end of the rope can be attached to an anchor or managed by rescuers. A wrapped canoe is held in place by a balance of forces on each side of the rock. Any successful rescue will involve unbalancing these forces. Apply a small amount of force in the right direction, and the water will do the work for you. The most effective way to do this is to lift the end of the boat with less water. Lift with your legs, and be aware of your position relative to the boat – it could shift, and resettle on a different part of the rock. More lifters can be added, or a log can be used as a lever to lift an end of the boat. The concept of working with the water by unbalancing the forces on the canoe is essential for successfully unpinning any canoe. Keep this key idea in mind when moving to more complex systems. Hauling on a line attached to the boat is often not as effective, since it is not possible to apply force in the best direction – straight up on the end of the canoe. However, it is possible to apply more force by including more rescuers and by using mechanical advantage systems. Depending on hazards in the river, and the group of rescuers, it may not be safe to have people out in the river pulling directly on the boat. Attaching a rope allows rescuers to pull from shore. All pullers should be on the upstream side of the rope to avoid being knocked over when the canoe floats free. Never wrap rope around your hand. 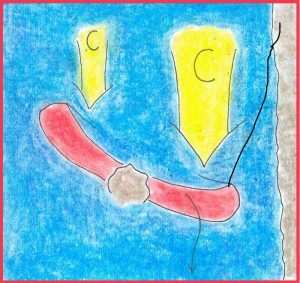 Hauling on a canoe from shore involves an enormous amount of force, so instead of attaching directly to a grab loop, set up a canoe bridle to distribute the force across the hull of the boat. Pulling rotates the boat to unbalance the force of the current on the boat. By working with the water, the boat swings free. 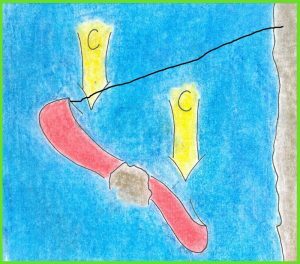 Incorrect: if the hauling line is attached to the close end of the boat, pulling rotates the boat to balance the force of the current on the boat. When working against the water, the boat will resettle in its original position. It is not possible to pull to rotate the boat when hauling from the close shore. Consider direct contact on the boat, or pulling from the far shore. Start by pulling directly on the rope. Add more pullers to increase the force applied. Adjust your angle by moving upstream, downstream, or up an embankment. 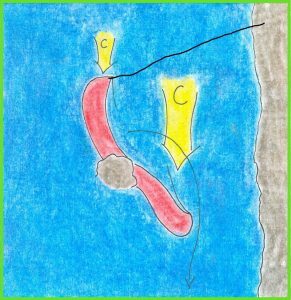 If the canoe still doesn’t pull free, find an anchor in line with the angle that seemed most effective, and set up a mechanical advantage system. Be creative: be wary of fixating on one technique. If it is not working, try something else. You may find a solution by combining ideas: a line tensioned with mechanical advantage could apply just enough force that rescuers in the water are able to lift the end of the boat.